I’ll start by saying that I read these books for the characters and the relationship between them, and not particularly for the plot. In that sense, it was not a surprise that my favorite thing about this final book was getting to see how much the characters grew throughout the series and how the relationships between them developed. I loved how Ronan and Adam’s evolution as characters could be seen in how much the relationship with their families changed, in very different ways for each one of them. While one of them grew closer with his family, the other got away from them, but in both cases it was what was best. The other thing I really liked was the romance in this book; it’s an amazing thing when slow burn romances finally pay off. I loved the way the relationship between Ronan and Adam unfolded; I was so captivated with all the scenes between them, because they were so beautifully written that I felt touched and fascinated with all the little gestures. In Gansey and Blue’s case, I loved that they relationship was still as subtle as it had been throughout the other books, but there were still some great scenes between them. Lastly, I really enjoyed the writing style. Maggie Stiefvater has a beautiful way with words; she made me engage with the story and I became completely engrossed by it. I felt a lot of things were left without a real conclusion, too many questions were left unanswered and some story lines and characters didn’t get the recognition they deserved. There were surprises, but nothing that was mind-blowing. There was just one thing that was really surprising and it was something that was revealed about Blue, but I felt like it wasn’t explained that well and it kind of came out of nowhere. Also, there was a part of the story (it had to do with an auction) that I didn’t care about at all and to me it didn’t connect well with the main plot of the book. I feel like the time that was spent in that story line could have been used to explore things that were more related with the quest to find Glendower, because the ending of that part of the plot (that was so important throughout the books!) felt so lackluster. Furthermore, I thought that some characters that were part of this series all along were left behind in this book without it affecting the other characters and I felt it was really weird and unrealistic. At the same time, there were some new characters that even if I liked them, they didn’t matter that much to me because they arrived so late in the series. But still, they got such a prominent role in this book. I don’t know how this is going to sound but I feel like there were some characters in this book (particularly one of them) that were put in just for the sake of having more diversity, but the way they were incorporated to the story didn’t feel organic. Don’t get me wrong! I’m glad there were some diverse characters, but I feel like they were a last minute thought, and I ended up feeling like they came out of nowhere and they were accepted to quickly in the dynamic of the group, which didn’t feel realistic. My love for the characters and for the way the relationships between them unfolded was what (in a sense) redeemed this book for me. 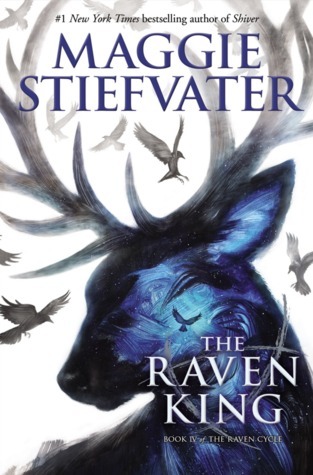 If it wasn’t for that and for Maggie Stiefvater’s amazing writing style, this book would have gotten a lower rating. Have you read this book? Did you enjoy it? Do you think it was a good ending for the series?